The black-faced spoonbill, an endangered migratory bird, has migrated to Okinawa for the winter. On January 9, nine black-faced spoonbills were spotted at what is known as “Triangle Lake” in the Yone area of Tomigusuku City. The black-faced spoonbill is part of the Threskiornithidae family, and is distinguished by its black, paddle-like beak and appearance of the area around its eyes being connected. It is found on the Korean peninsula and in China, and spends winters in Southeast Asia and Kyushu and other parts of Japan. It is designated as an “Threatened 1B” on the Ministry of the Environment’s red list, indicating that it is at high risk of extinction. 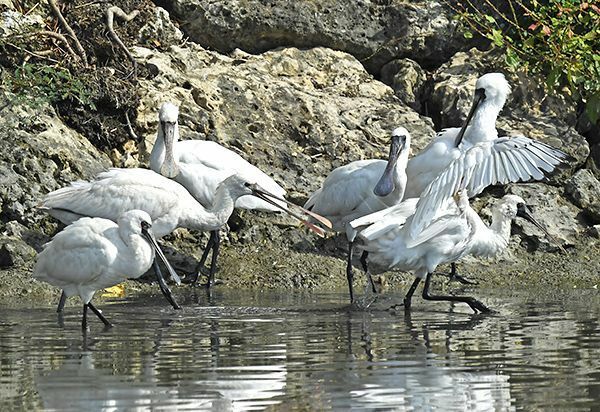 A male bird-watcher, aged 60, said he spotted several black-faced spoonbills starting in November of last year. Their number increased in December, and he spotted 22 of the birds at Lake Man and near Naha Airport. “The number of birds will increase as it gets colder,” the man said.